Building a Four Stroke Motolite Bucket Racer. Four stroke leads two stroke! 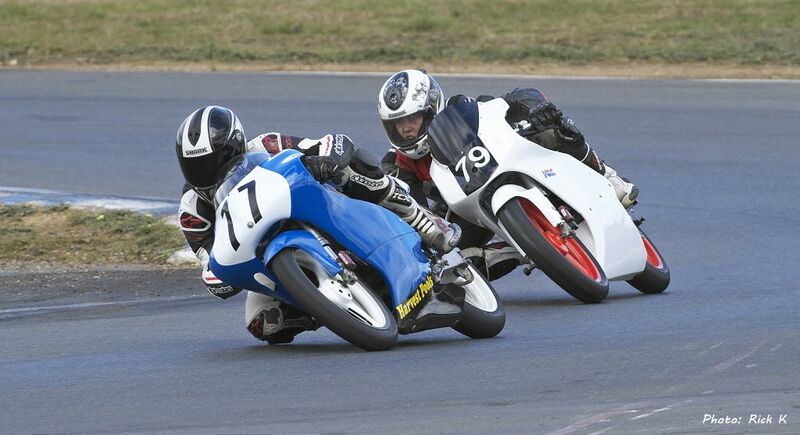 #14 KenLawrence (Honda RS CRF150R) and #59 Garry Briggs (BBR Honda RS CRF150R) both four stroke stalwarts lead two strokers Ron Carrick Yamaha YZ85) and #93 Paul Borg (Honda RS85cr) at an Eastern Creek meeting. 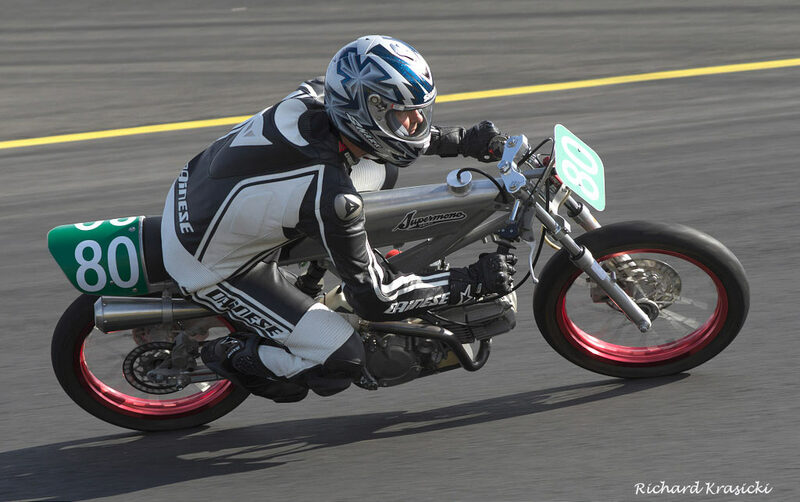 What are your equipment choices for a successful four stroke Motolite Race Bike? So you've decided you've got the knowhow, resources and time to build a winning Motolite. Depending on how much work you intend to do yourself will dictate how much time you personally put into the project and have a bearing on the cost. What chassis, engine, wheels etc to use, should it be two stroke or four stroke? The Motolite rules are pretty open except for capacity of four stokes being dictated by the valve count and whether water or air cooled. 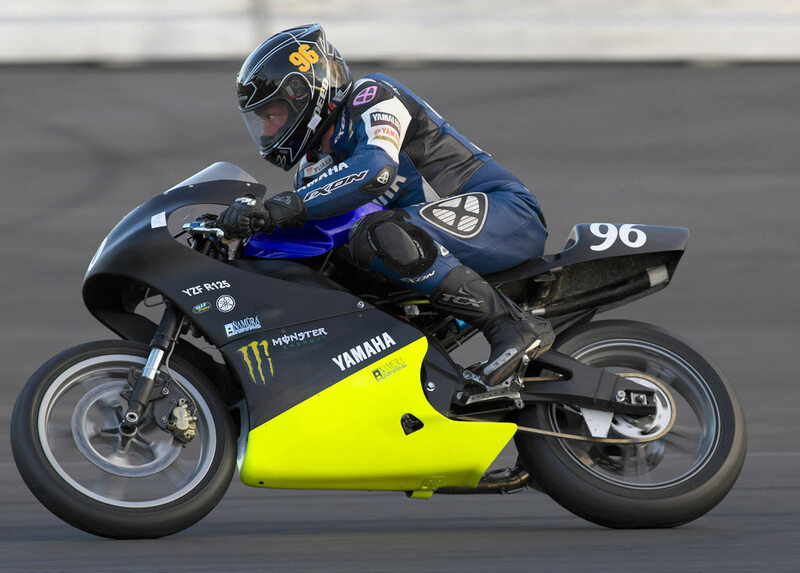 The performance parity of these different capacities and engine configurations have proven to be very close in performance and lap times creating competitive exciting racing for the Motolite class. These capacities are maximum sizes, a tolerance of 2% is included within these capacities. The Motolite class is open to any grade of rider. The choice of engine to be used can dictate the chassis needed. We are only considering the four strokes in this article. 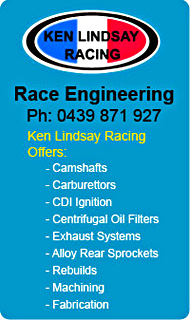 The following list is by no means complete but covers engines readily available here in Australia. Suitable chassis for the above list of motors can be almost anything, but using one that works is the trick for success. 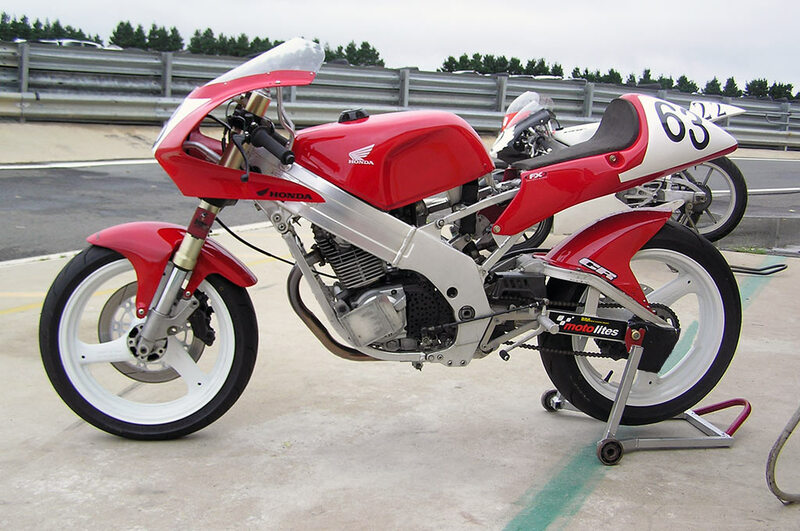 For a decent rolling chassis you can't go past the Honda RS125 GP bike for it's handling and light weight. This would be the ultimate solution as suspension, brakes, weight and handling are all sorted and full attention can be applied to the motor and fitting. However it may not suit all the motors listed for instance getting the 230cc engines to fit is a bit of an engineering feat but it can be done. Trevor Lusby won a Motolite championship in the not so distant past with RS GP running gear wrapped around one of these engines albeit in 185cc form as the rules dictated at the time. Also with the four stroke engines the later RS125 chassis with vertical rear suspension unit has to be used as the horizontal rear suspension unit in the earlier chassis gets in the way of the taller four stroke engines which means they won't fit. 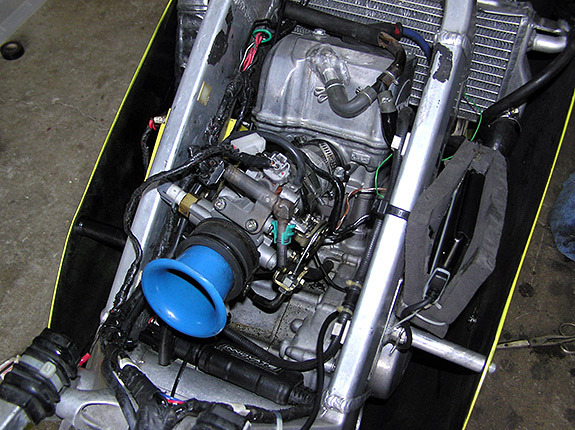 The two stroke motors fit in the earlier frame as it was designed for these engines in the first place. The CBR150 and CRF 150R motors sit well in the later Honda RS125 GP Chassis. Motolite race bikes with either of these engines have had great success in the past winning the one hour enduro many times and countless Motolite Championships. Honda CBR150 Motor 150cc 4 valve twin cam water-cooled 6speed gearbox. Which of these two engines to choose would boil down to availability. There is little or no difference in performance that is after they have been modified. These bikes have proved a match for the Honda RS85cr GP framed bikes with the right rider on board. 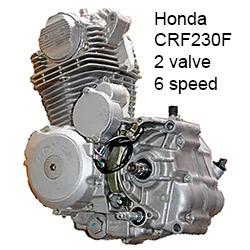 The CBR150 engine can also be used in it's own frame or in the CBR125 frame, wider rim wheels would be advantageous but not essential if it's delaying your debut. Michael McLean ran a bog standard CBR150 to great effect for a few years and had a lot of fun doing so. Fuel injection is also an avenue that can be explored as seen here in Ken Lawrence's Motolite which runs the CRF150R motor. However this is the exception to the rule, the carbies still rules usually flat slide Keihins or Mikunis. For the Yamaha and Aprilia 159s these are originally 125s with the capacity taken out to the maximum 159cc. Usually these engines are used with their original frames and running gear as they are sold as reasonably well appointed sports bikes. Being over the counter road bikes they will be a bit heavier than an RS based machines but can still be an very effective racer. The challenge is to shed as much weight as possible. Right: Jeff Brown hustles his much modified Yamaha YFZ150 along to good effect. The only real difference between these 2 motors is the Honda has a six speed gearbox whilst the Crossfire engine has a five speed. No real drama for the five speed as these engines have a abundance of mid range torque and a six speeder seems almost superfluous. They share the same bore and stroke (65.5 x 66.2mm) with a lot of the parts being interchangeable. There is plenty tuning bits available for these engines and they can be made to go quite well. Again talk to the tuners advertising on this website. The Crossfire engine sells for around $640.00 brand new. At this price it leaves plenty of room for spending on go faster gear. With both engines they would have to be modified, cam, head work, exhaust and larger carburettor would be the norm to get to the pointy end. Fuel injection is also an option. Weight wise these engines would be several kilos heavier than the 85cc two strokes but would go some way to make up for it with their meatier torque curve. As mentioned earlier these engines can be a bit of a squeeze to get into a Honda RS125 chassis, it can be done but it would be best to check with any of the people advertising on the website as they have done this previously. 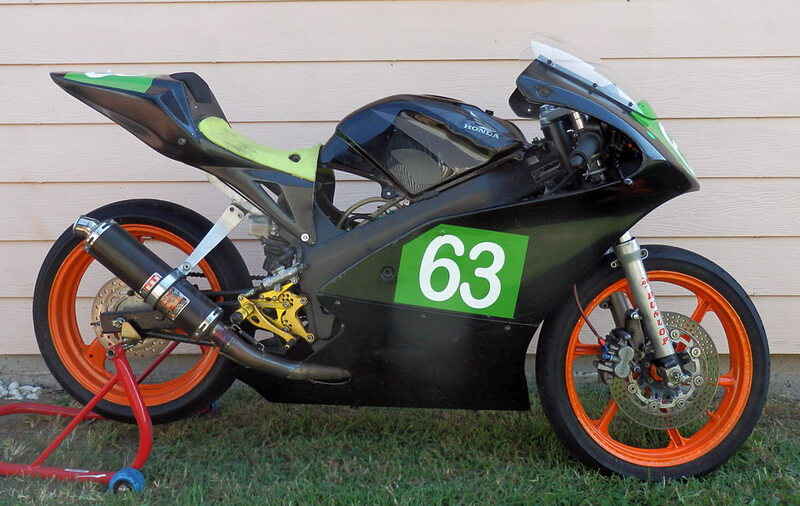 Currently a Honda 210 cc engines is running in a Suzuki RGV250 chassis the ex Bob Murphy bike now in the capable hands of Clark Russell. Another alternative chassis choice would be to slot one of these engines into CBR125/150 frame which can be picked up quite cheaply. Wider rims than standard CBR125s would probably be desirable. There may be other frames suitable read Aprilia Yamaha FZR125/250 KTM125 but these haven't been tried. 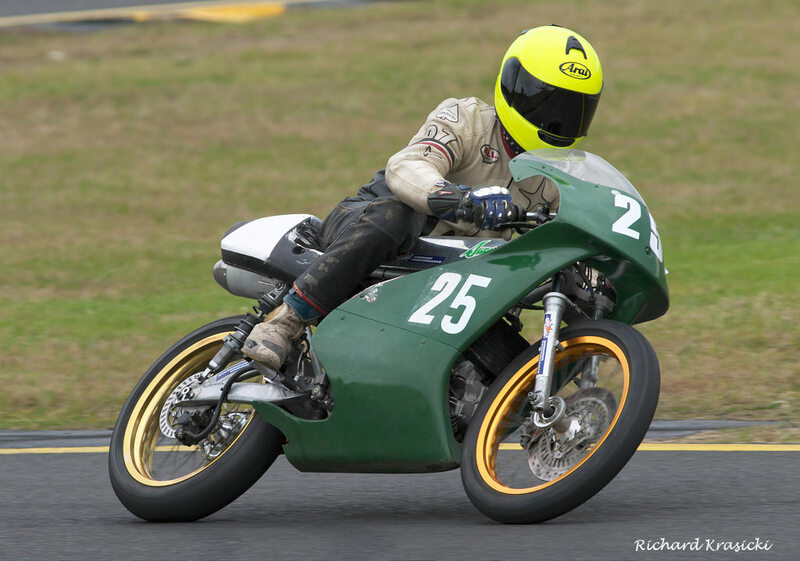 For the other engines the 190cc Daytona engine powered Supermono's have been having success finishing second in the first round of the 2016 Sava Tyres Bucket Nationals at the South Circuit at Eastern creek and being regular visitors on the podium. When the Supermono is purchased it comes with a basic Chinese 150cc motor which is uncompetitive although it's quick enough to get some race miles under your belt. The complete Supermono with 150cc engine will set you back a mere $1990.00 ready to go. Contact Nigel Begg on 0452 433 523. To make this little gem (Supermono) competitive you will would need to purchase the Daytona Anima 190 four valve engine, it bolts straight into the Supermono frame. Whilst out of the box this engine is a lively performer, to be really competitive in this class and as with the other engines covered above the Daytona engine needs a tuners touch to be seriously competitive. 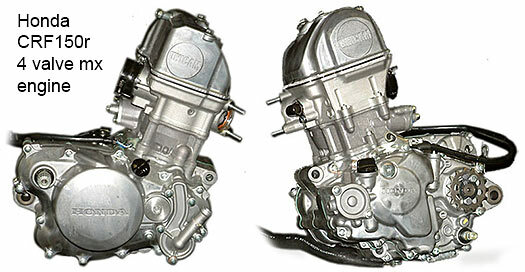 You can sell the 150cc motor on to offset some of the costs of buying the bigger engine. 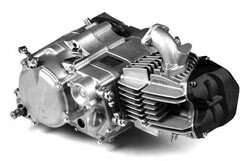 The Daytona 190 air cooled motor has a horizontal layout with four speed gearbox, four valve head with roller rocker arms and bore 62mm x stroke 62mm. The motor sells for $1399.00. Download Engine user manual for full specs. 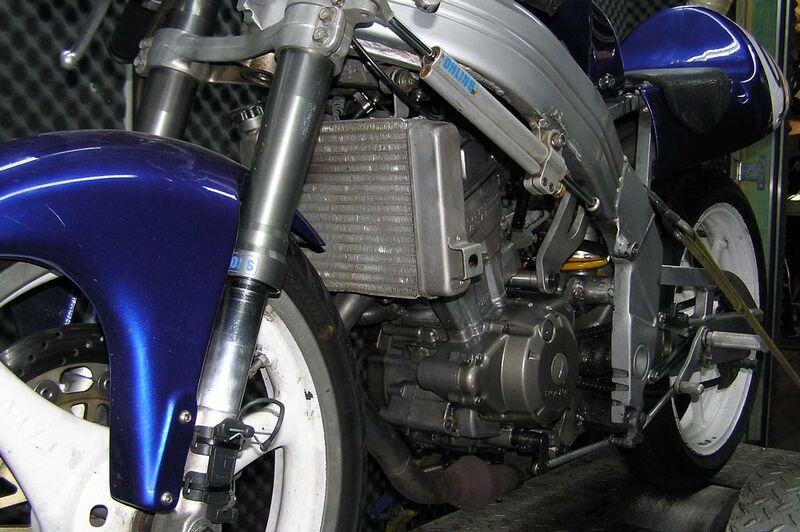 This engine could also be a candidate to slip into a Honda RS125 GP chassis. 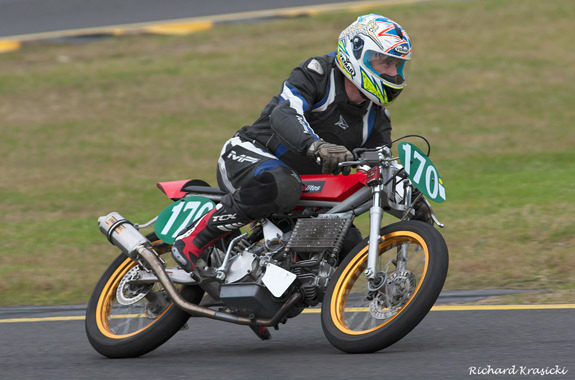 Michael Child aboard the Supermono190 finished second in the first round of the 2016 Sava Tyres Bucket Nationals at the South Circuit at Eastern creek.. This was just a run through some of the possible combinations of engine and chassis available for four stroke use in the Motolite class, you may have other ideas of a winning combination. Don't just keep keep thinking about it DO IT! 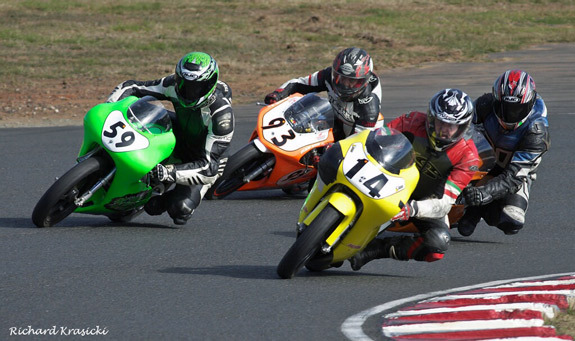 If your budget is tight we would suggest get your bike built and ready for the track before spending up on engine modifications. All of the above engines have good performance standard out of the box and would get you into the fray immediately. With a few races under your belt and some experience of what is required then turn your attention to getting more out of your package. Cheers see you at the track! The #77 BBE Kawasaki chassis with CBR150 motor. One of the most successful Motolites ever built. This bike was originally built and raced by Garry Briggs of Big Bang Racing and first appeared in 2005. The Kawasaki ZZR250 frame was used as the rules didn't allow race frames at the time. The running gear, forks, wheels, brakes etc are off of a Honda RS125 NX4. Since being built this bike has won five one hour enduro's and five BRA/PCRA Championships in the hands of various riders. Now ably pedalled by Christopher Jones this bike looks like it will continue being at the pointy end of the Motolite class for some time to come. Christopher Jones in action. Winner of the 2015 One hour enduro. Chris was partnered by Adam Cameron. 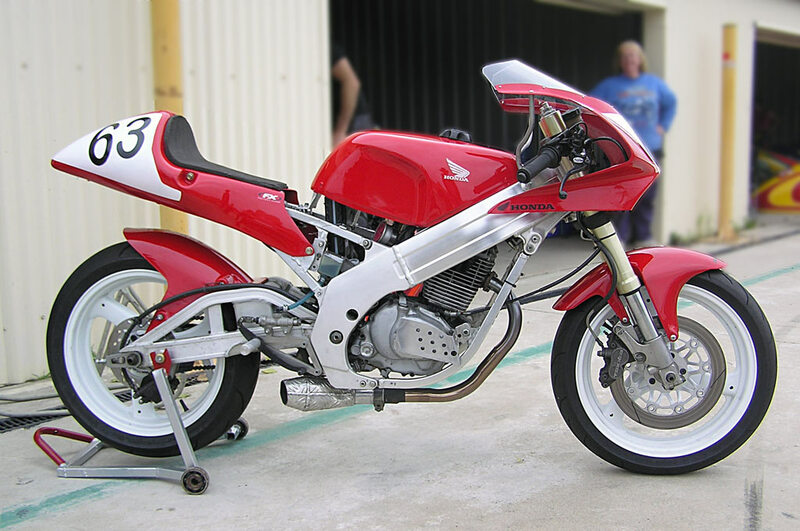 Since this bike was built the BRA Motolite frame rules were relaxed to allow pure racing frames and with a plentiful supply of Honda RS125s available at reasonable prices they became the rolling chassis of choice. If you are after an RS chassis contact Trevor Lusby. The #77 machine with Tyler Bradford and co-rider Stephen Kairl won the 2014 One Hour Enduro. 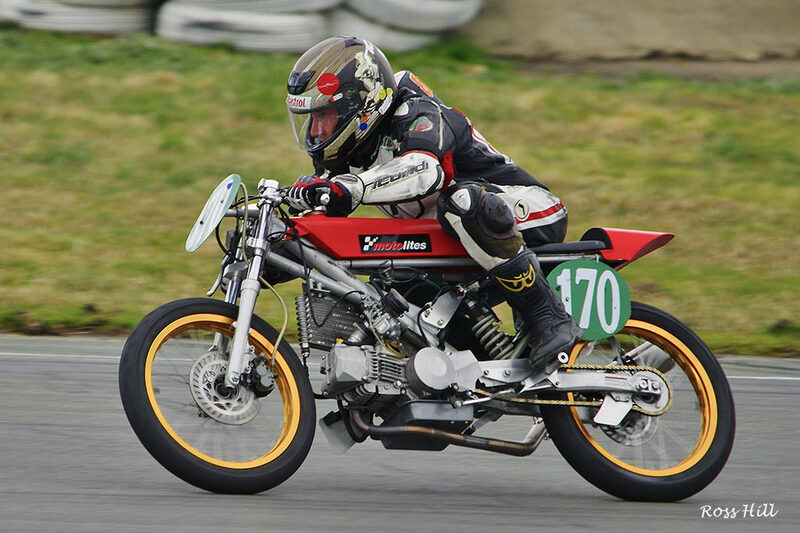 Tyler also won the 2014 BRA/PCRA Motolite Championship on the #77 bike. Matt Burtons super modified BBR Honda CBR150 finished runner up in the 2015 Motolite Championship. 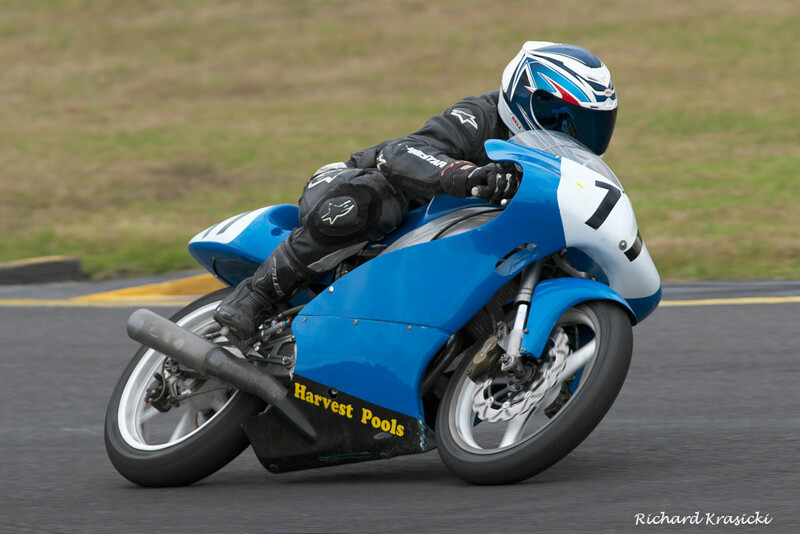 The ex Bob Murphy RGV 250 Suzuki rolling chassis fitted with bored XR200 to 210cc 2 valve Honda air cooled engine. As can be seen in the pictures the Honda engine fits the Suzuki frame with room to spare. Nigel Begg creator of the Supermono husltes along on the Big Bang Racing prepared bike at Eastern Creek. #80 Colin Berry Supermono another stalwart of these unique machines. Blair Briggs has put in some great rides on the Supermono. Shown here on the way to fifth in the 2015 One Hour Enduro sharing with Michael Child.